A rather elegant and high-class country with a frugal disposition. Although he isn’t a good fighter, he’s survived by marrying countries left and right. 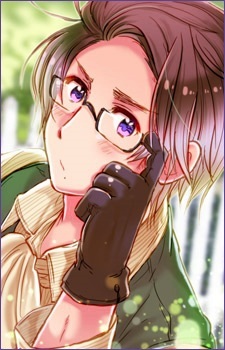 He has violet-colored eyes and brown hair with an ahoge that sticks up by his part (which was confirmed to represent the Austrian city of Mariazell). Hungary and Austria were married at one time, and Hungary once worked in his house as a servant when the Holy Roman Empire still existed. They eventually got divorced, but it was for diplomatic reasons, not because there were bitter feelings between them or anything of the like. During the times of the Holy Roman Empire, Italy (then Chibitalia) was also his servant. Austria was the one responsible for Italy having to wear dresses, for he thought that he was a girl. It wasn’t until Italy’s voice changed that he realized Italy’s true gender, commenting under his breath that he knew that something ironic like that was bound to happen. He doesn’t really get along with Prussia, mainly because Prussia took a lot of joy in pestering and embarrassing him at every chance he got. In the past, they often fought against each other in wars, but in present day, it appears that Prussia freeloads off of Austria occasionally. Switzerland also has a past with Austria. They were close childhood friends and were allied under one government, uniting the two countries. Switzerland usually found himself bailing out and saving Austria, who often got beat up by Hungary. Eventually, they grew apart thanks to their leader who failed to distinguish the two countries from one another. In present times, they try to avoid each other as much as possible and when put on the spot, they deny that they were ever friends. His personality and speech is that of what someone might describe as belonging to a young master of a rich household. Due to this and his stubbornness, you could say that he’s behind the times. Somewhat of a quiet loner, his motto is “hobbies before work.” His hobbies are cake, art, music, and piano (which he is quite skilled in playing). Hidekaz Himaruya revealed that he has no sense of direction whatsoever, which is based off of a joke about an Austrian salesman who got lost in his own warehouse. It was also revealed that he is deathly afraid of marine animals and is not the outdoorsy type. It was said that he doesn’t wear glasses due to having bad eyesight, rather it is because he feels that he would look “plain” without them.